Hillsborough: “Wow! Duckenfield’s Apologised!” No Big Deal. As I type, it is the evening of the 11th of March 2015, although it will be a long while yet before anyone gets to read this. The revived Inquests into the causes of the Hillsborough Disaster of 1989 have been in progress for a little under eleven months – nearly twelve if you count the opening day of 31st March 2014, although that day was only used for the appointment of the jury. The last two days have been amongst the most nervously anticipated of the entire proceedings, for the Match Commander at the Hillsborough Stadium on the day of the Disaster, then-Chief Superintendent David Duckenfield of the South Yorkshire Police, has taken to the stand to answer questions about his handling of the police operation that fateful day. There was a considerable hullabaloo on social media in the later afternoon today, especially on the Twittersphere, after Duckenfield expressed his apologies to the survivors of the Disaster, and the families of its victims, and for his various failures on the day. Most particularly, he apologised for the notorious lie he told to Graham Kelly and Glen Kirton, then of the Football Association, that “Liverpool fans without tickets had forced open an exit gate” in order to get into the stadium without paying. There was some excitement among many Hillsborough campaign-supporters about this apology, as though it were a resounding new development. Taylor’s description make it sound like the apology had to be rather pulled out of Duckenfield like teeth from healthy gums, but fair is fair; Duckenfield did apologise, and long ago. Indeed, today was not even the first time Duckenfield had apologised during the rebooted Inquest. He apologised, somewhat half-heartedly again it must be said, just yesterday, when acknowledging in rather fudged, rambling terms the failings in the way he led the police operation at Hillsborough. His use of the conditional words ‘If there was a failing’ beforehand perhaps gives the apology a grudging, not-very-magnanimous quality – as though hoping to play on any lingering doubts there might still be that he had failed – but even so, he quite definitely used the words ‘I apologise’. No, this latest apology is not a big deal in itself. The only aspect that makes it significant is the fact that, for the first time, Duckenfield directed the words quite explicitly towards the families of the victims. That is long, long overdue, as is the fact that this time, unlike during the Taylor Inquiry and the original Coroner’s Inquests, where he was an evasive and unhelpful witness, he has made some kind of effort to offer account for what he did twenty-six years ago. Studying it, the account he gives is at times confused and contradictory, or stands in stark contradiction of what he has said previously. But even so, the account is of far more substance than his previous attempts, and he has at last shown a willingness to acknowledge mistakes and omissions in his conduct, and that he was not the right man to lead the police effort on the day. Whether that will ever be enough for his apologies to be accepted is not for me to decide, but it needs acknowledging that it is far more than he has ever conceded previously. I have come to realise that, the other day, when I wrote that Monday’s Panorama documentary about the Hillsborough Disaster – Hillsborough: How They Buried The Truth – all seemed a bit of a generic re-tread of old ground (see https://thegreatcritique.wordpress.com/2013/05/21/hillsborough-meet-a-silly-old-dear/), I’d managed to miss something quite substantial in the newly-released footage from the BBC archives. The main reason for missing it is that the BBC didn’t really do anything to draw attention to it, but having studied one particular clip, and checked it against official records, I have noticed there may be a very serious issue that the documentary quietly raised. This snippet of commentary is a very familiar explanation, discredited within hours, for what caused the crush in the central pens. But the interesting thing about it is that, according to the graphic that appears on the screen, the time that Motson said it was 3:13pm. 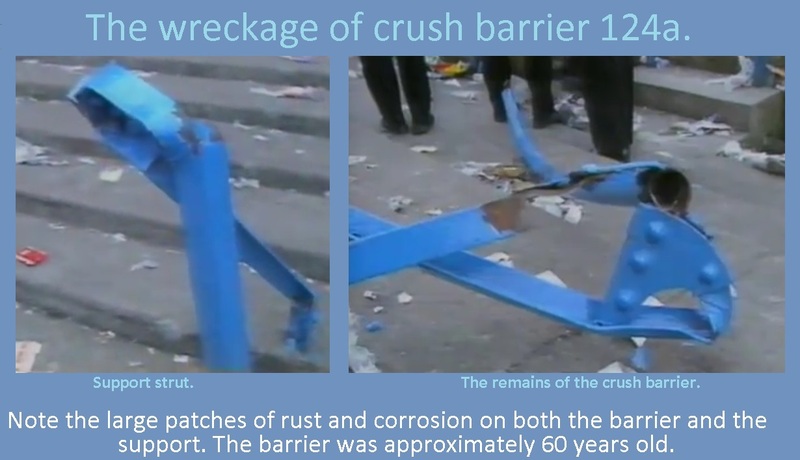 The notorious established story has it that the lie about a broken gate began when it was spun by Chief Superintendent David Duckenfield of the South Yorkshire Police to Graham Kelly and Glen Kirton of the Football Association. This was supposed to have happened when they confronted him in the Police control box, even as the tragedy was playing itself out on the terraces below. This is even iterated in very damning terms in the Taylor Interim Report. The problem is that all sources detailing that confrontation between Duckenfield and the FA officials, including the FA officials themselves, agree that he told them the lie at 3:15pm. Therefore, Motson’s commentary, unwittingly propagating the myth of ticketless fans taking advantage of a broken exit gate, was given voice some two minutes before Duckenfield so infamously peddled the same lie. Now this would in no way at all exonerate Duckenfield, who was still knowingly spreading lies to shift blame for his mishandling of the crowd onto the victims, but it does raise a rather chilling question as to whether or not he really was the one who invented the ‘Broken-exit-gate’ red herring after all. It is now possible that somebody else invented the idea, and that he just went along with it. Therefore, we now need to know who exactly passed this false information to Motson at such an early stage. Did somebody in the South Yorkshire Police other than Duckenfield spin this lie? If so, who was it? The Independent Police Complaints Commission needs to investigate and find out. It would constitute evidence that the blame-shifting was not just being improvised by an individual officer in a moment of panic, but was becoming actually orchestrated, even conspiratorial, at an even earlier stage than was previously demonstrated by the Report of the Hillsborough Independent Panel. And above all, whoever did it needs to answer for it. EDIT 26-5-2013: According to the Taylor Interim Report, Assistant Chief Constable Walter Jackson entered the control box to find out what was going on, around the time the players were taken off the field. He might have known something about this, and was high enough in authority to orchestrate a blame-shift story in a moment of panic. I must stress that we have no way of verifying whether the anecdote is true. Interestingly, it has loud echoes of a frequently-told apocryphal story about Duckenfield himself supposedly hiding under a table as the Disaster unfolded, a story that is clearly untrue.